Things I liked: This is awesome! Things I liked: Lightweight, accurate, great power at 25-30 yards. I have beaten many birds with him. Great value for money. 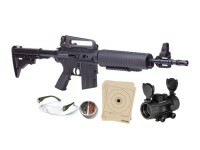 Easy to pump The UTG red dot combines excellent with this M4. Things I would have changed: Although well-made, plastic should be of better quality, less glossy, for a more realistic look. I would like even a little more power output. Things I liked: Rifled barrel for shooting pellets. Things I would have changed: Adjustable front sight. What others should know: The description states tool included for front sight adjustment. There was no tool included for this & after further inspection, I noticed front sight has no adjustment. In fact, the front sight pin is molded to sight & is not adjustable. The carry handle also was defective & mounts crooked to rail. Also the sight on handle has not been drilled properly as both holes are same size & not counter sunk as on the others I've purchased. 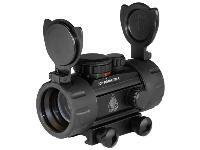 The UTG red dot sight was not shipped to me either, but I'm working w/ PA about this. I've purchased several Crosman airguns over course of my life & this is the first time their gun has fallen short of quality as advertised. Mine came with non-adjustable front sight and no tool. A call to Crosmans customer service and an adjustable sight and tool were in the mail. Whats included in the package?Please tell me from A-Z , all the things. Mine has a molded front sight not adjustment at all and no tool in the clip either. 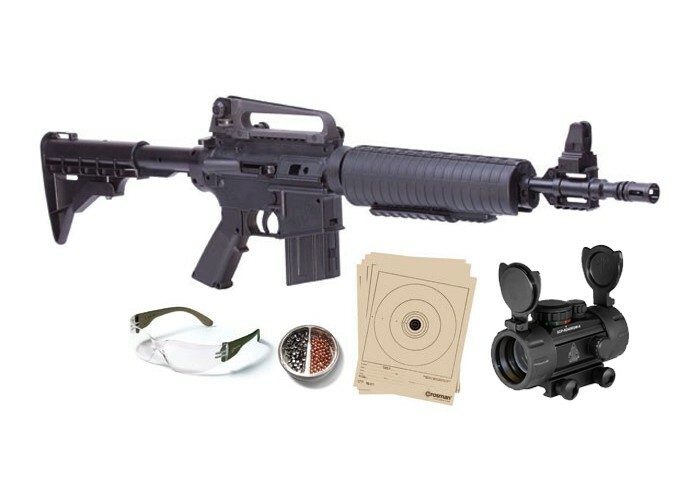 Includes black rifle, targets, ammo, safety glasses & UTG 30mm red/green dot sight with integral Picatinny mount. 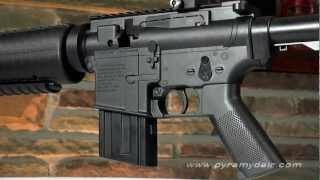 Also seems as Crosman has done away with the adjustable front sight & sight adjusting tool.